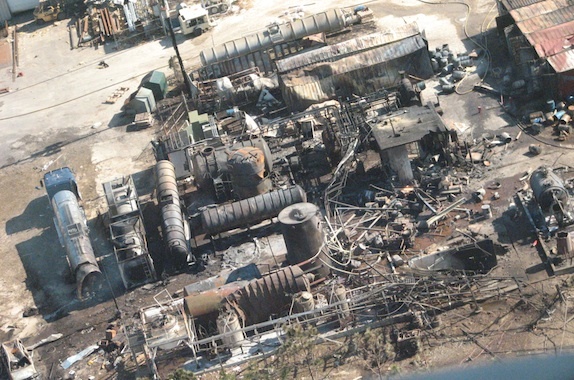 At 1:33 pm on December 19, 2007, a powerful explosion and subsequent chemical fire killed four employees and destroyed T2 Laboratories, Inc. (T2), a chemical manufacturer in Jacksonville, Florida. It injured 32, including four employees and 28 members of the public who were working in surrounding businesses. Debris from the reactor was found up to one mile away, and the explosion damaged buildings within one quarter mile of the facility. On December 19, T2 was producing its 175th batch of methylcyclopentadienyl manganese tricarbonyl (MCMT). At 1:23 pm, the process operator had an outside operator call the owners to report a cooling problem and request they return to the site. Upon their return, one of the two owners went to the control room to assist. A few minutes later, at 1:33 pm, the reactor burst and its contents exploded, killing the owner and process operator who were in the control room and two outside operators who were exiting the reactor area. The CSB found that a runaway exothermic reaction occurred during the first (metalation) step of the MCMT process. The CSB tested the T2 batch recipe to determine the most likely failure scenario. A loss of sufficient cooling during the process likely resulted in the runaway reaction, leading to an uncontrollable pressure and temperature rise in the reactor. The pressure burst the reactor and the reactor’s contents ignited creating an explosion equivalent to 1,400 pounds of TNT. This webinar discusses the CSB investigation and findings. Robert Hall is a Supervisory Investigator for the U.S. Chemical and Hazard Investigation Board. He has more than 30 years experience in the design, inspection, and evaluation of hazardous systems, specializing in mechanical integrity and regulatory compliance programs. He is also a member of the ASME B31.4/11 Committee for Hazardous Liquid and Slurry Transportation Pipelines.